But why the decision to homeschool? Well, we decided a few years ago that for us, the benefits of individualized attention would have a bigger impact on what they learn. If we could teach them in the manner in which they found it most easy TO learn, they would be able to get so much more out of it. It also meant that they wouldn’t get tired of school, or discouraged, or lose the joy in learning as so many of our children do today. We were seeing it first hand with Grace. She went from jumping out of bed, anxious to get to school, to absolutely dreading it. Sometimes there were tearful conversations as to why she had to go. We aren’t sure exactly what happened. But the change was drastic….and if you follow that with some gaps in her education (due to many reasons that we won’t get in to right now) we realized that maybe homeschooling was a way for us to rekindle the love of learning as well as fill in what she was missing. It only felt natural to remove Annalea as well, even though she was only in Kindergarten at the time. One other big factor was that our children were not being surrounded with the Godly values and character traits that we deemed important. To put it simply, they were being raised by their peers for almost 10 hours out of a day. That was simply unacceptable to us. So, with the help and guidance of some friends (one in particular who homeschools her many beautiful kiddos) we struggled through our first year of homeschool. It was crazy, scary, constantly changing and full of mistakes. I don’t know if we learned a whole lot of actual facts that first year…but we learned a lot about what we could all handle, what we all liked, and mostly what worked for us. I realized that I, as well as the kids, need structure. I am constantly battling the fear that I am shortchanging my kids by not sending them to a public school. But when Carl comes home, and says how much they’ve grown and how amazed he is at what they are doing, it helps reassure me that what we are doing is working. It’s hard to see it day to day. It’s kind of like weight loss…unless you can see some side by side pictures, you never can tell the daily changes. I know I get a lot of comments that challenge my ability to teach considering I am not a teacher. Trust me, I know that I am not a teacher. But I have been teaching my children from the day they were born. I also know that homeschooling, teaching them science and history, is a very different animal than teaching them how to tie their shoes or play nicely with friends. But someone once gave me a piece of advice that I have kept in the forefront of my mind. She told me this: “You don’t have to teach them anything, you just have to teach them how to find the answers.” She was right. Now I know that there are some basic things they have to learn such as math facts and reading….but all the other stuff, the scary stuff for me, I don’t have to know it to teach it…I just have to make sure they know how to find the answers. And that is something I CAN do. And the cool thing is that we have found books that present each subject in a manner that we approve of and that they can understand. Presentation done. If they don’t understand, then we find the answer together. Not only do they understand a new concept, but they are learning how to find answers to questions they have. And THAT is what they need to learn. Education doesn’t stop at graduation, be it from high school or college. Education and the subsequent knowledge happen on a daily basis. There are always thoughts and ideas that kindle your desire for more information….and there is no one here to teach me about those things…I have to go find the answers on my own. Anyway, all of that to say that even though I’m not a teacher, my kids are learning….and they are doing it in a way that keeps us all happy. So on to how our day runs. We get up (when we feel like it) have some breakfast and jump in. A lot of what they do is self taught, especially Grace. She does reading, memory work, writing, grammar, spelling, math, geography, and bible all on her own. Annalea does spelling, writing, grammar, math and bible on her own. Then she and I do some phonics together. Then all of us do history and science together. We are usually done around 1 pm. Then the rest of the day is open to whatever we want to do…sightsee, exercise, playtime, or chores and errands that have to be done. Since then we have finally settled on a science and history curriculum. Our science curriculum is called God’s Design for Science. I enjoy the layout, ease of reading, and how they make each subject applicable to multiple grade levels so we can do the work together. We let the kids choose which subjects we would study first, and they decided on God’s Design for Life which is a one year curriculum including plants, animals, and the human body. So far, we are all liking it quite well. Our history is very new, I just received it last week. The book is called Mystery of History. It took me a while to settle on a history curriculum. I wanted something that was based on the bible, but also taught some world history. I was very happy to find Linda Hobar’s book. I love how it’s set in a conversational tone so the younger kids feel like they are listening to stories, as well as the references given to allow older students to get more in depth information on whatever strikes their curiosity and interests! They also have wonderful resources including email addresses to other homeschoolers that volunteer their time to answer questions and help with concerns. Freely Educate. I love this blog!! The owner/creator, Lori Seaborg, does a wonderful service by blogging about free education finds. She is quite passionate about proving that a high quality education doesn’t have to cost much money. If you haven’t checked out her blog, I highly suggest you do. She has some amazing information and resources on there! KISS Grammar. This is a subject specific website. Grammar. (Oh, how I loathe you) But Dr. Vavra presents Grammar in a way that my children, especially Grace, understand. This subject was getting to be such an issue until we came across this site. The website is a bit hard to follow at first, but once you’ve taken the time to make sense of it, applying it to the daily grind is pretty easy. And we have made some serious strides in understanding since starting this way of learning it! CurrClick. I like this site if I’m looking for information on a specific subject. Since we don’t have access to a library, their choices and prices are right up my alley! Another one worth mentioning is Jungle Search. You can search for many products on Amazon..but I like their free ebook search tool! And let’s not forget the Pioneer Woman Homeschooling over at Ree’s site. Her blog is just awesome! I think that’s about it for now….this has been a longer post that I originally set out to write…but I hope you have a general idea of the how and why we homeschool. If you have questions or comments….suggestions or ideas…PLEASE leave a comment…I appreciate all the responses from you all! We homeschooled our oldest son from 1st grade on. When it was just he and I, and especially in the younger years, I found homeschooling to be a breeze. We’d spend about an hour or two on traditional things like learning to read, math, etc. and then spend a couple of hours out exploring some chunk of nature or museum or something similar. Sometimes we’d just go to the park and talk about the Civil War or Civil Rights or religion or whatever, just to get the ideas flowing. 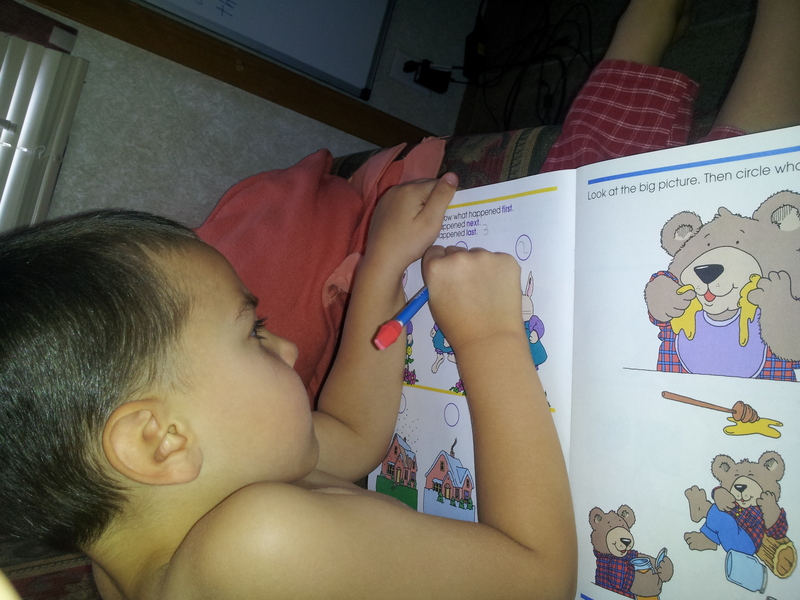 Teaching him to want to learn was always my goal more than just providing the facts. We were traveling from the day we began homeschooling, and only in the last couple of years did we “settle down” for long enough periods at one time for him to attend a public school. We decided to have two more babies (both boys, one due in September! ), and while pregnant thought it would make more sense to be in one spot where we could see the same doctor through the entire pregnancy. Anyway, he was asking to go to public school and so we decided to enroll him. I’m not going to bash the public school system (though I will say that Oregon and Pennsylvania have great public schools, North Carolina, not so much), I think he’s gotten something from that which he wouldn’t have from homeschooling, but personally I would recommend homeschooling your kids (or especially, roadschooling them!) over sending them off to anyone who’s willing to put the time in. The feeling you get, and the bond with your child, by teaching them life’s basics like reading, is one of the most fulfilling experiences of my life. Like you said, the alternative to homeschooling is to allow your kids to be raised by others for a majority of their lives, and the change is definitely noticeable. Not that having outside influences is always a bad thing, but if your goal is to instill your own morals into your child, it’s far more likely to succeed with homeschooling than letting “the village raise your children”. Enjoying your site, glad to see you posting something about homeschooling! ~>Looking forward to your next blog! Thank you so much, and welcome! It’s nice to share our journeys with like minded people (and we love the growing that comes from interacting with the different minded). Awesome! 🙂 Love your updates, Mary! you know that *you* were the amazing helpful supportive person with the beautiful kids i was mentioning right?! You’re welcome! miss you all too, can’t wait to see everyone!